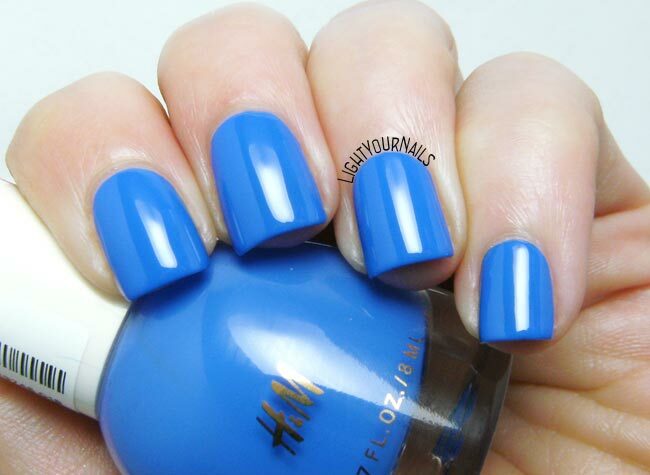 H&M Lapis Lazuli | Light Your Nails! Do you ever buy nail polish and forget about it? Even if you purchased it because it was love at first sight? Well, it happened to me with H&M Lapis Lazuli. I bought it back in January for 1€ (winter sales), but I like the colour so badly that I would have bought it for its full price anyway. Then it went in a drawer that I only opened again last week! And it was love again. This time I couldn’t wait and wore it immediately. H&M Lapis Lazuli is a gorgeous blue creme, wonderful shade and perfect formula. It’s a one-coater and it applies like butter, it dries quick and glossy. I am so in love with it. Seriously, I wanted to do a nautical nail art with it, but I liked it so much on its own that I didn’t dare covering it. If you like shades like this and you have the chance of a nearby H&M shop with beauty corner I totally recommend running there and grabbing this baby. You won’t regret it! I love it, too! But then again, I love all blues! It's a shame you can't get H&M nail polish. The new range is amazing, esp. the cremes. Grazie! Piace moltissimo anche a me! Definitely lucky! I always try to check H&M during the sales because they have great deals on make-up! I know you have lots of nail polish but you should give one of their cremes a try! This blue my mind...get it?! Simply put, its beautiful. Indeed it is a wonderful shade! It's a gorgeous ocean blue for the summer! Thank you! It definitely screams summer! Haha, can I say I am glad I'm not the only one? Quando capito da h&m voglio vedere se lo trovo!! Wow, I love that shade of blue! dico che lo voglio! :D stoltamente sono stata a Milano e non sono entrata in nessun H&M, scordandomi del tutto la loro linea beauty che volevo vedere ç___ç me tapina. ps. ti segnalo che, prima delle foto, c'è scritto "In foto: due foto senza top coat" anzichè passate :) ciau! Spero che lo trovi perchè ne vale davvero la pena, è bellissimo!